Ever heard of the Crab? No, not that one. And no, not that one, either. The Crab is a unit of measurement used by astronomers. Most space-based telescopes rely on it! But it might be going out of style. 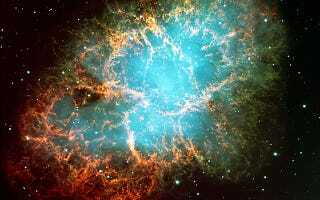 It's all thanks to the Crab Nebula, one of the brightest things in the sky (well, at least if you're looking up with x-ray eyes, which I admit is not all that likely). At the center of the nebula is a giant pulsar. A pulsar is formed when a star, at the end of its life, is big enough to blow off its outer layers in a nova, but not quite big enough to collapse into a black hole. Almost every star spins, but as it collapses inwards it spins faster, and sometimes it spins in unusual ways. For example, it can spin in a way that doesn't quite share an axis with its magnetic field lines. Stars give off radiation along their magnetic field lines, so if a star's spin and field lines don't match up, it emits pulses of radiation as its field lines spin toward us, and then spin away again. Now it looks as though astronomers will have to get their Crabs elsewhere. The pulsar seems to be as reliable as ever, putting out a good steady signal, but the nebula is getting in the way, dimming its intensity. So far, there are no new ideas about how to replace the Crab Nebula as a source of calibration, or The Crab as a unit of measurement.